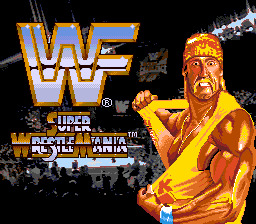 Play WWF Super Wrestlemania Now! Wrestlemania is the biggest wrestling event ever, so it was only right that they make a video game out of it. So they did. This game allowed you to pick from Ultimate Warrior, Ted Dibiase, Hulk Hogan, Shawn Michaels, Randy "Macho Man" Savage, British Bulldog, Irwin R. Schyster, and PaPa Shango! If you're and old wrestling fan you'll love this game, with matches of 1 on 1, Tag Team, Survivor Series, and Championship. Take the role of one of the wrestlers and win the title. This is what wrestling is all about. Wear down your opponent in the ring blow by blow, suplex by suplex, kick by kick, until he is knocked out and ready to be pinned. If you're in need of help in the right match, tag your partner in for a double dose of beat down. Pin for the 1..2..3.. or get them out of the ring for the ten count and win the title!